My last weekend in DC (of Summer 2012)! Friday: Pat and I drove out to Mount Vernon on Friday. It was so nice! We left early so that we could avoid some of the crowds. After buying our tickets for the tour of the mansion, we had about forty minutes to just walk around the grounds. 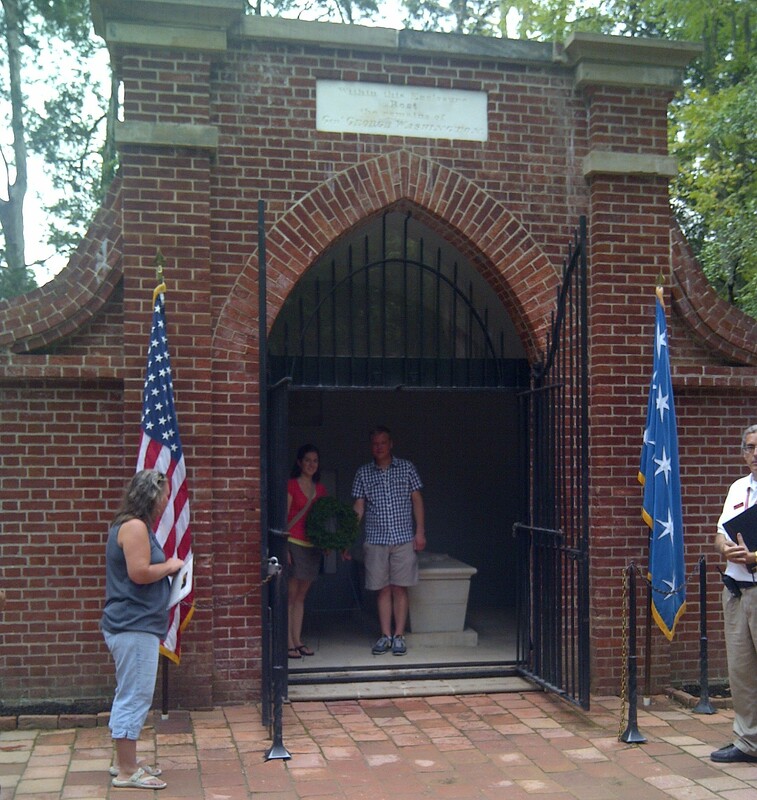 We went down to the tomb with the remains of General George Washington and his wife, Martha. The tomb was gated and locked when we got there. While talking with the historian at the tomb, we learned that there was going to be a wreath laying ceremony that we could see if we waited a few minutes. When the gentleman said that he needed four volunteers to help with the ceremony, Pat and I both offered to help. One woman read a prayer, while another volunteer lead the Pledge of Allegiance. Pat and I had the job of the laying the wreath in the tomb! 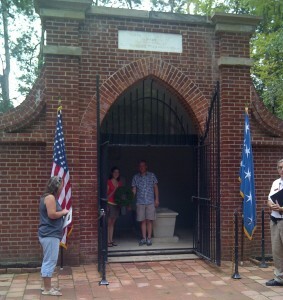 We actually got to stand in between the sarcophagi with George Washington and Martha Washington! It was an experience of a lifetime. Friday evening, Pat and I went to the Capitol Hill Club for Happy Hour with some of his friends from his internship in DC last summer. It was nice to meet his friends and hear them tell stories about last summer. Toward the end of the evening, there was a raffle and I won! Saturday: On Saturday, Pat, Kendal, and I went out to Chantilly, VA to the Air and Space Museum in the Steven F. Udvar-Hazy Center (near Washington Dulles International Airport). The museum is incredible! One of the first planes you see upon entering the museum is the Lockheed SR-71 Blackbird. 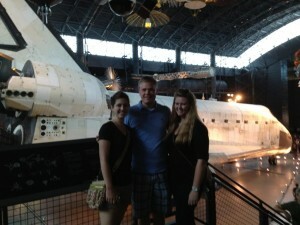 The Blackbird, the Concorde, and the Discovery were my favorites at the museum. Saturday evening, Kendal and I met up with her roommate and friends for the Nationals/Braves game, which the Nationals won! There was a post-game concert Saturday night which was fun. Sunday: Sunday morning, Kendal and I went out to Old Town Alexandria for church and then met up with my friend for brunch. We had time to wander around Old Town and browse some of the shops. It was a really nice, relaxing day. Monday: Work was busy on Monday because I’m wrapping up all of my summer projects. 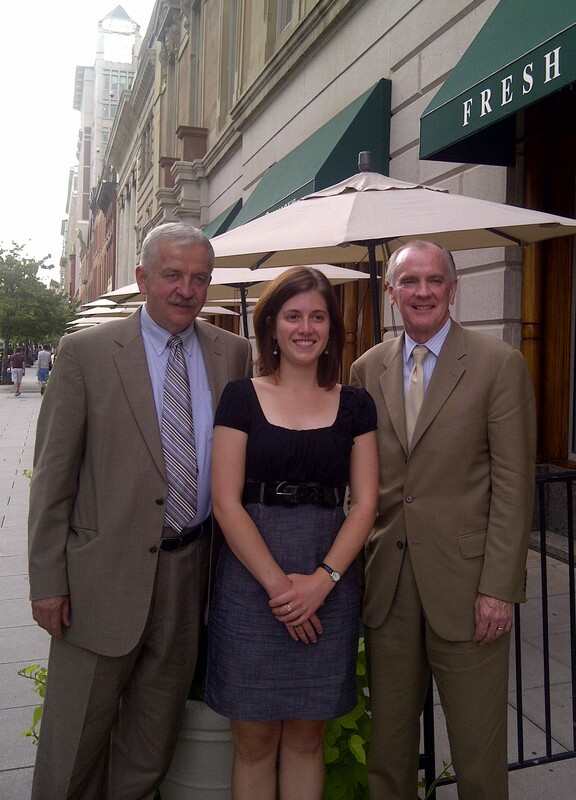 After work, Jim and I had dinner with President David Szczerbacki, the VP for Public Relations and Strategic Communications, and the Director of Major Gifts and Planned Giving (all from The College of Saint Rose). We went to McCormick and Schmick’s and had a great meal. I’ll admit I was a little nervous before dinner, but it was a lot of fun! The company and the conversation were both great! As sad as I will be to leave DC, I really am looking forward to going back to Saint Rose. Tuesday: I cannot believe that this is the final week of my internship. This morning, Jim, Becky, Richard, and I went out to breakfast because they are all leaving for the Board Meeting in Ann Arbor, MI. It has been an incredible 8 weeks with them in the Executive Office. It has been an honor to have this internship opportunity. Have a great day everyone! As always, thanks for reading! 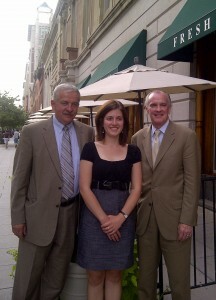 ← My day at the Capitol! Your last weekend in DC “of summer 2012,” are you planning on returning? Is DC a possible future home? I know it’s one of my favorite places to visit, I’m very fortunate to have friends down there! Hi Kayla! Yes, I am already planning trips back to visit friends and I can see myself moving to DC after graduation next spring. While I have enjoyed my time in Albany for college, I think this is where I want to be for a few years after school. If everything plays out, you and I will have to be sure to get together when you come down to visit!